I couldn't get the $15 unit to work without switching the NO connections (lock must be to GND, unlock must be to VPWR) and cutting (removing) the pneumatic wire loop. Now my '89 w201 locks and unlocks with the fob. I uploaded a schematics with the connections I am making. Removed jumper to allow for pneumatic opening. I draw power and from a Red & White wire coming to the pump and ground the circuit with the Brown wire in the same bundle. I tried connecting the Module to each one of the Two green wires out from the pump to the doors, separately both times with same results: Module clicks but does not operate the pump. What is wrong? please help. Curious if there is a way to make the windows roll up as well? Hey guys, just wanted to give a huge thanks to everyone who contributed to this thread, especially treiberg, urtruelove78, compu_85, and jay_bob. You all helped me immensely to actually give this thing a shot. My drivers side door lock on my '86 190D crapped out about month ago and so I bought one of these $15 chinese ebay specials (identical to all these wiring diagrams). All I wanted was basic lock/unlock functions so I don't put more wear on the remaining passenger/trunk lock cylinders. And for the convenience of course. Got it all wired up thanks to the great info in this thread. urtruelove78's clarified diagram really helped me out. Got it working, but the keyfob lock/un-lock keys are reversed and do the opposite of what they should. Pressing lock un-locks the car, pressing un-lock locks the car. I'm a novice at all of this, but I feel like a fool for not being able to figure it out. I have cut the pneumatic "jumper" wire to enable the longer pulse so it works with the vac pump system. I couldn't exactly glean what to do with the white/black and orange module wires, but tied together the module at least works. I tried tinkering with lots of possible combinations with the orange, org/blk, wht, and wht/blk wires but nothing seems to help. If your remote "stops working" (you press buttons and hear clicks but nothing happens) it has to do with the anti-theft system falling into an unsure state thinking someone is trying to break in. Don't worry, you can reset this using key. If you ever have a battery event (goes flat, take a boost, etc) whereby the computer loses power. You will have to remember to do the key in door locking thing first, before the remote will "start working" again. Actually the remote is working all the time, the car is just ignoring the inputs on the Yellow wire until it "learns" that the car is not being stolen (a key has been used in the door). Red/White or maybe just Red is HOT +12 all the time, from battery. Brown/Blk or maybe just Brown is GROUND all the time. Yellow is the input to the computer. Supply a +12 pulse on yellow (taken from the red wire is fine) for UNLOCK all doors. Supply a GROUND pulse on yellow (taken from Brown wire is fine) for LOCK all doors. I discovered something freshly after playing with these wires when doing the install. The car computer may ignore inputs on Yellow after the installation, hence the remote will appear to be not working. Stays this way until some event happened that caused the computer to reset. I think using the door lock with key to do a lock/unlock cycle, or starting the car, or something... forget exactly what, but it was simple and caused the car computer to begin paying attention to the remote signals again. After doing that, supplying the pulses on the Yellow wire again at the trunk are revived. I'd suggest trying to supply brief pulses on the Yellow wire MANUALLY by touching it for half second to the mentioned supply +12 or GROUND. When that's working, wire up your remote receiver relay to give these pulses when using the remote button. When you release the button make sure the remote receiver is releasing the relay so the pulse comes off the Yellow wire so it is allowed to hang "free" again. Some remote receivers have a "latching" feature, don't pick that, use the "momemtary" feature... in other words the relay only holds for as long as you are holding the remote button. 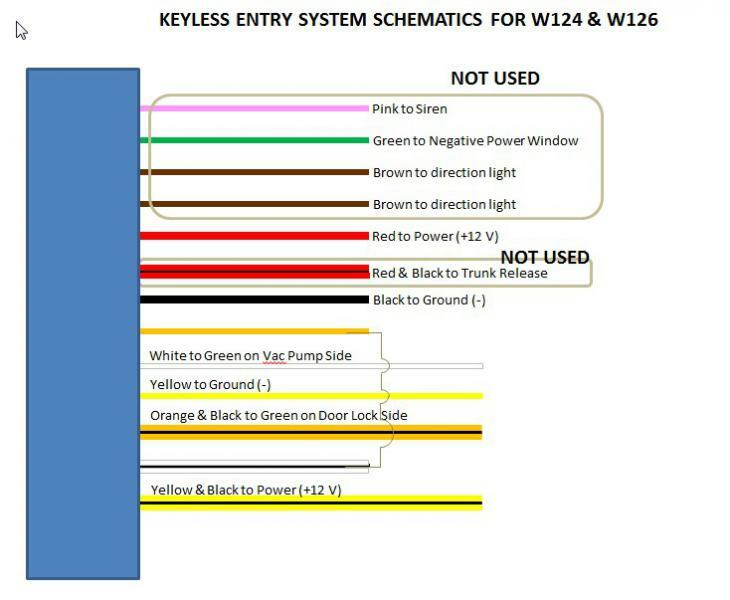 The EMT diagram shows the Yellow input "resting" on +12 (Unlock). That's just a convention for diagramming, don't actually do that. Let Yellow hang free when neither remote button is being pressed, offering no signal to the computer. In order for you do this, you need a 2-channel remote, with 2 relays. If you try to use a 1-channel remote with 1 relay and just take off from its N.O. and N.C. contacts you won't be successful. (That was my first try). Last edited by scottmcphee; 11-12-2013 at 03:06 PM. Try supplying the brief pulses on the Yellow wire MANUALLY by touching it for half second to the mentioned supply +12 or GROUND. When that's working, wire up your remote receiver relay to give these pulses when using the remote button. Your 12volt remote 2-channel receiver will get power from the Red and Brown wires mentioned above. If you draw this out, you'll see what's going on. any random malfunction of the receiver unit causing it to activate any combination or sequence of relay pulls, is safe. Yellow wire can only possibly receive one kind of signal at a time, and rests in neutral (no signal). Last edited by scottmcphee; 11-12-2013 at 03:09 PM. And it's now down to $6.50 !! Can life get any better? If the batteries in the remote fade, cheaper to get a WHOLE system with new remotes than buy replacement batteries. Mine like this is still going strong.. how many years now?? Four!? Haven't had to replace the batteries yet, and I'm sure these are the cheap china no-name brand battery in there. Oh I see this particular one does not include battery. I have one very close to this remote depicted (attachment). Nice remote with metal, and a sliding cover over two buttons with symbols that show lock and unlock. The remote is "thumb size" so you can see the receiver part is very small as well. I tucked the receiver up on the ledge of the right tail light assembly, because radio waves need to reach it, and easily penetrate the plastic shell and lens of the tail light assembly. This remote control switch can be used to control lights, electrically operated doors, windows, curtains, etc. 1.with IC seats,can according change work way to L4/M4/T4, output way can be adjusted, can take voltage output with direct control motor and reversing, also can output two road independent switch signals, data bits can be adjusted. 2. Wireless remote control switch is a widely used wireless control device, the microprocessor intelligent control, it can be used in the garage door control, lighting control, remote control curtain and other fields, and has convenient installation is simple to use safe and reliable. Note:Now this item not include battery, Post mail not allow ship include battery,buyer need have a 27A 12V battery. Last edited by scottmcphee; 11-12-2013 at 02:56 PM. One of the things I like using the trunk latch remote entry is that it is silent. No horn honking, lights flashing, all you can hear is the vacuum solenoids which are pretty quiet. I don't like the attention getters of modern cars remote entry systems, those are dead giveaways for key fob robbing scoundrels to quickly find your car in a parking lot to help break in or make off with it. It all seems to be wired correctly, and i even hear the pump pushing air when i press the remote buttons, but nothing happens, the doors won`t lock or unlock, neither is the fuel door. What did i do wrong, or, what is messed up, please ? Do the central locks work when you use the key? Does your car have orthopedic seats? I followed the directions exactly as trieberg posted in the wiring diagram, but only get clicks from the module (as several other posters were getting). The car is a 1987 MB 560SEC. The locks work perfectly with the key. Frustrsted after several hours. Any help appreciated. Please send a cc to my personsal email at benzjag@hotmail.com. It is water under the bridge now. You could have a working Keyless for $50 and 30 minutes install time, plus technical support. Just read the testimony from happy customers. I have one for sale if you are interested.